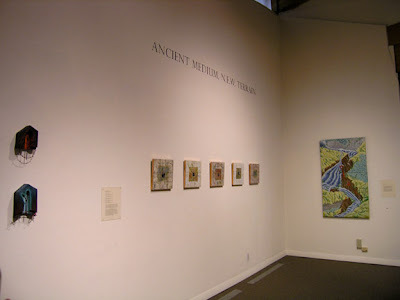 Yesterday was the opening of our show of works in encaustic, Ancient Medium, N.E.W. 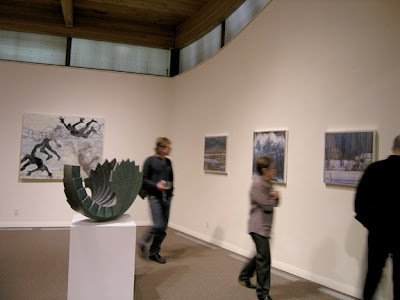 Terrain, at the Art Complex Museum in Duxbury, Mass. 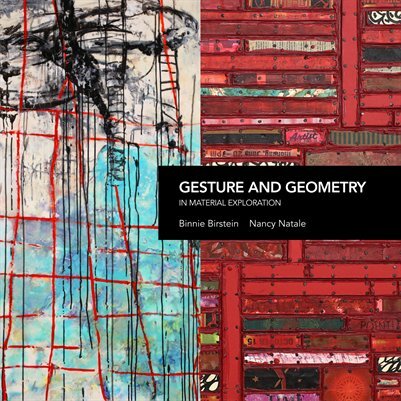 The show runs until September 6th, and we hope that some of the encaustic conference attendees will make the trip to Duxbury to see the show of some 70 works by 23 members of New England Wax. 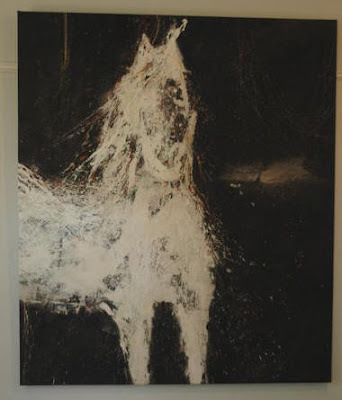 Greg Wright's complex encaustic painting "Current Tendencies", 54" H x 30" W. This image is darker than the painting's real colors and doesn't show the probably 8 million dots of paint that build up its surface. 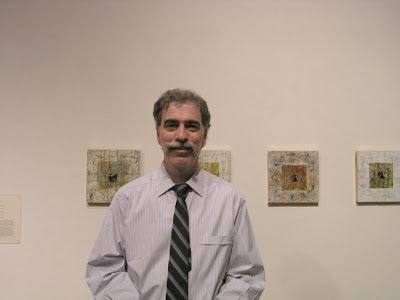 The museum's curator, Craig Bloodgood, juried the show from digital images and did a beautiful job installing the work. 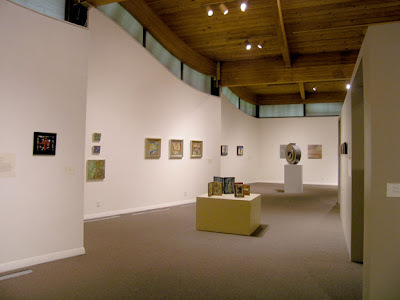 The Art Complex Museum building is an unusual shape, and the large gallery where our show was installed contains a smaller rectangular gallery in the center of the space where selections from the museum's print collection are shown. This means that N.E.W. 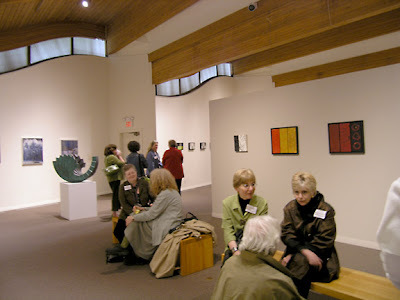 's work was shown around the perimeter of the gallery. 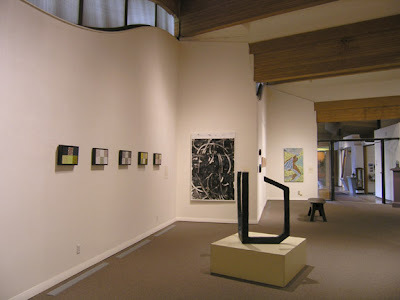 This view is looking back toward the entry door and shows the work of Jeanne Griffin, Beverly Rippel and Richard Keen on the pedestal. 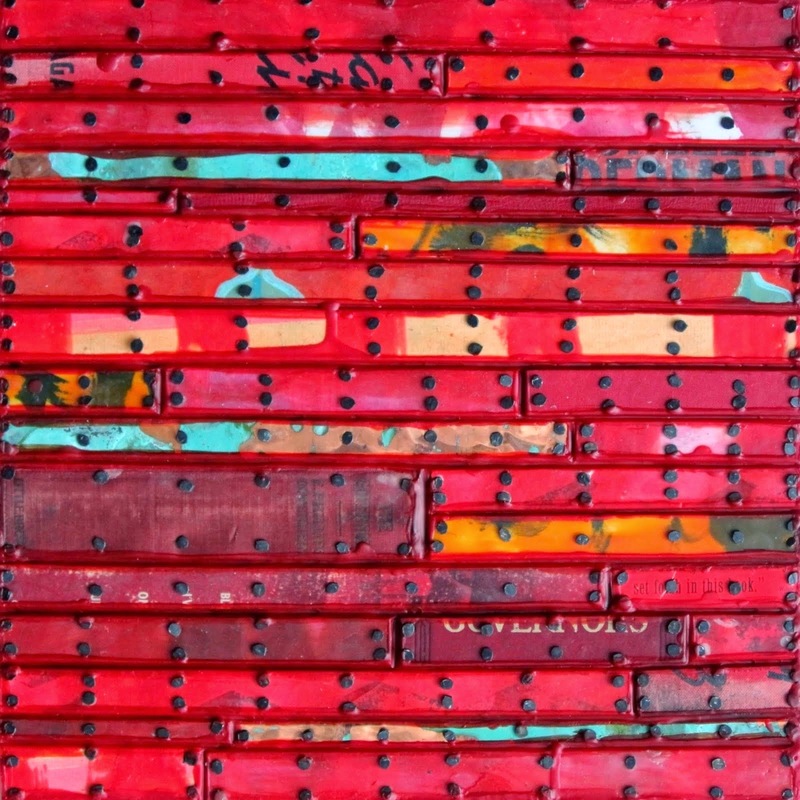 A closeup of Richard Keen's work, "Blue Hull Cross Section," 38" x 28" x 26", styrofoam, plaster and encaustic. 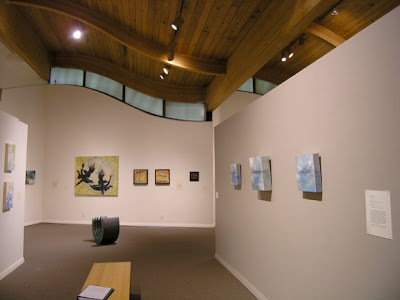 Continuing along to the back right corner of the gallery, work left to right is Binnie Birstein's "The Fence", Kim Bernard's "Carapace" and three pigment prints with encaustic on paper by Mary Taylor. 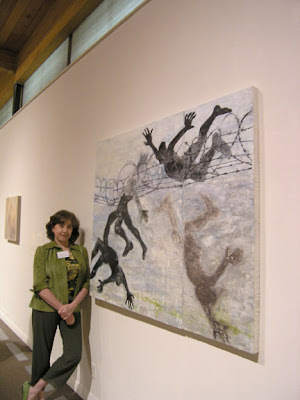 Painter Binnie Birstein with "The Fence," encaustic and mixed media on panel, 48" H x 58" W.
Turning the corner to the back of the gallery, there were benches with artists and viewers and four encaustic paintings by Julie Shaw Lutts (three visible here). On the perimeter wall opposite are five works by Donna Hamil Talman. 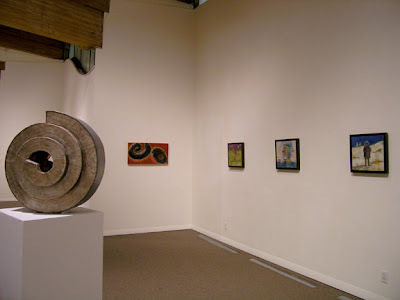 Continuing along, on the right, three works by Helene Farrar, then one by me, "Metamorphosis," and another sculpture by Kim Bernard, "Chambered Nautilus." 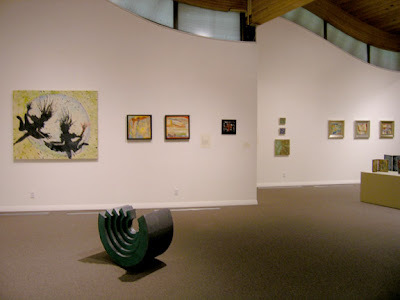 Turning around and looking back toward "Chambered Nautilus," we see L to R: "Cross" by Viola Kaumlen, three paintings by Catherine Weber, three collages by Diane Bowie Zaitlin, and four books on the pedestal by Jeanne Borofsky. 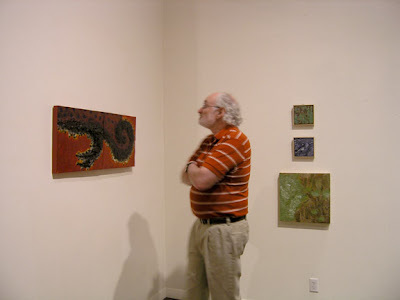 A viewer studying my work "Glow Worm" and behind him three of Catherine Weber's paintings from her lichen series. 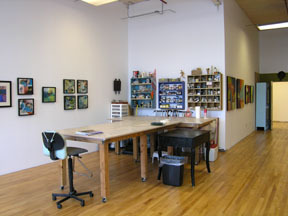 Five paintings by Kellie Weeks hung opposite this. Further down the perimeter side are L to R: Binnie Birstein's "Alice", two collages by Diane Bowie Zaitlin, Viola Kaumlen's "Cross." 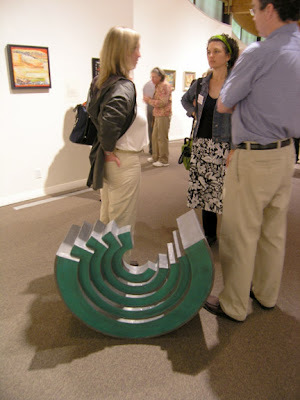 The piece on the floor is "Convolution" by Kim Bernard. Another view of "Convolution" with Kim Bernard (in headband) and two visitors. 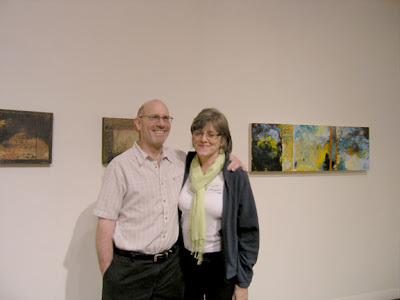 Greg and Lynette Haggard with Lynette's painting "When It Touches" at right. 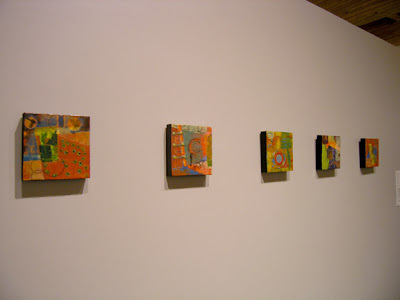 Works at left are by Dot Krause. 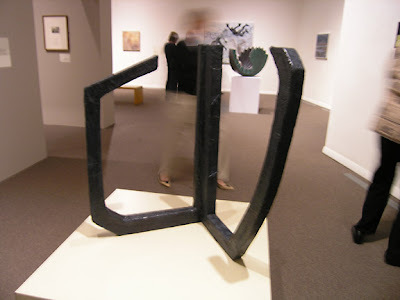 Closeup of a work by Dot Krause, "A Small Opening." 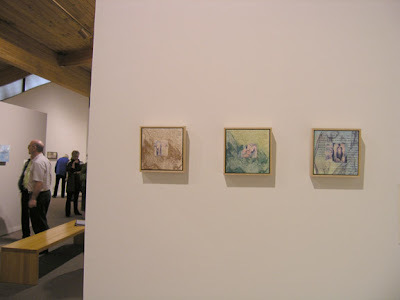 And next to Dot Krause's pieces were three by Jeanne O'Toole Hayman. Turning around and looking back toward "Convolution," we see two paintings by Kimberly Curry on the left and three by Charyl Weissbach on the right. Here are "Upwardly Mobile" and "Change in Motion" by Kimberly Curry. 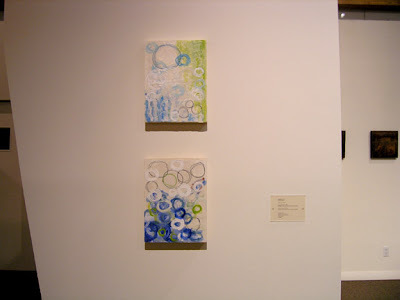 And three works from her water series by Charyl Weissbach. 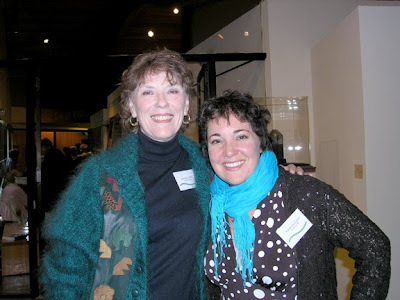 Two happy artists: Jeanne Griffin and Kimberly Curry. Phew! 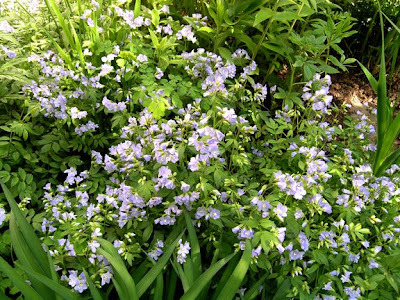 After saying the other day that I saw absolutely no honeybees in my garden this year, I spotted some working away on a patch of Jacob's Ladder. Here's the proof. That's not to say that there were a slew of bees around, but at least there were some. I felt relieved that all was not over immediately for our buzzy pals. 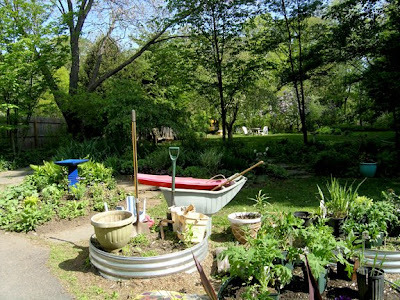 Yes, it was another day out of the studio and into the garden with lots of work to do planting, moving, mulching, weeding and most of all looking. I probably spend 30 or 40 percent of my time in the garden just looking. Mostly I guess I'm assessing how plants are relating to each other and to the whole. The opportunity to just look and study plants was what I most missed when all we had was a front garden in the city with people passing by and nosy neighbors interrupting me. If I hadn't been looking so closely, I wouldn't have seen the bees in this patch of flowers. 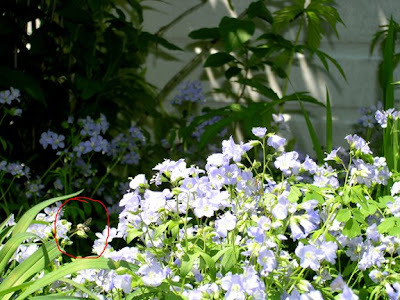 You have to get right in there and watch for movement to see the bees. On the other hand, I also look at a distance. 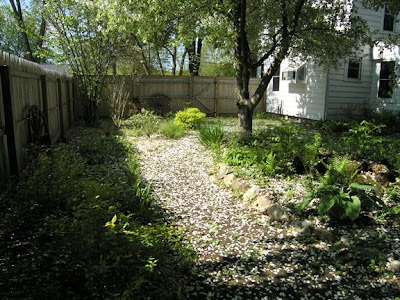 White petals from the still-fragrant crabapples looking like snow on the path. And seeing how sunlight comes through the cracks in the fence. The petals drift down on everything. 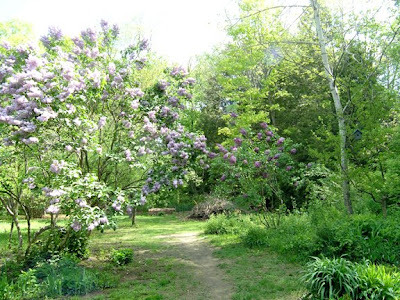 The lilacs are still very fragrant too and so abundant. Here's a dark purple double-flowered bush. But while looking, I'm also working. Here's my garden tool installation. Didn't I see this at the New Museum? 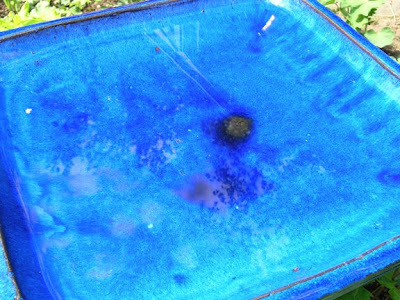 And notice our beautiful bright blue new ceramic birdbath at left rear. Bonnie spotted it while driving by a garden supply place and did a U-turn. It really is a striking color that looks great with plants although I haven't seen the birds in it yet. That dark spot is a bit of dirt brought in by - birds? While I'm reflecting, here's another one. 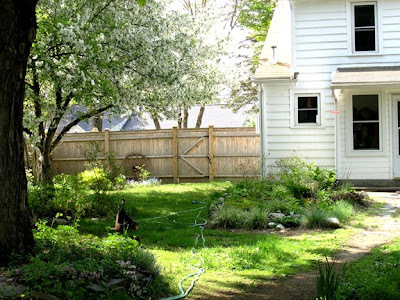 Such a beautiful spring! The looking is wonderful. 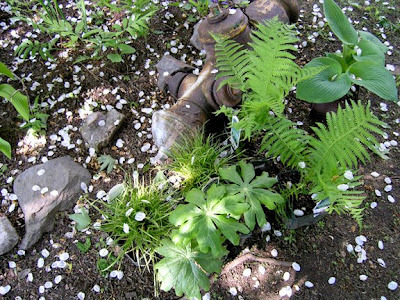 A Perfumed Spring - Our Last? 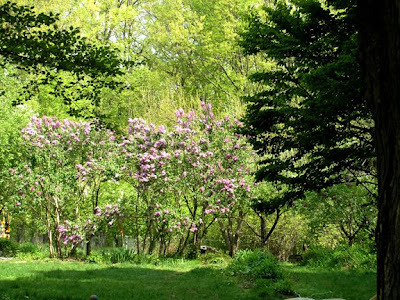 This is our third spring in this house and for the first time, we are just surrounded with the most incredible fragrance from flowering trees. 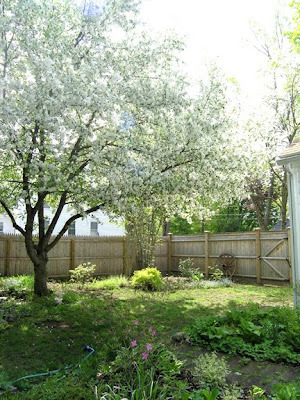 Two big crabapple trees in particular have been astounding in the bounty of their blossoms and the perfumed air they have provided. We have never treated them very well because the branches hung down very low and were in the way. We've been chopping them off since we got here, but now we'll treat them with more respect, I think, after seeing what they can produce. 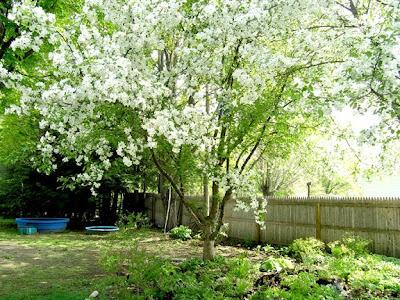 The perfume from those trees surrounds us as soon as we step outdoors into the yard. 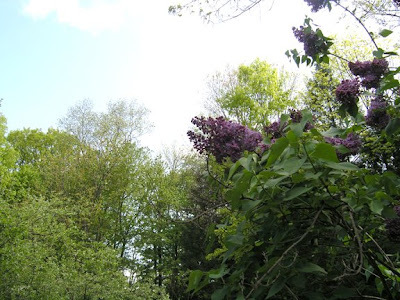 If the wind blows from another direction, we get the scent of lilacs - blooming way more prolifically than we have ever seen them. When the overload of blossoms on one lilac branch got weighed down by rain, the branch touched the ground. I stuck a rake under it until I could prune it back by cutting off a huge armload of flowers for the studio. 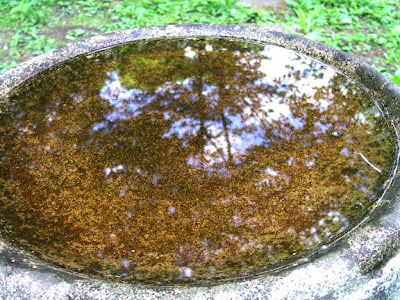 So here's the but...there is one big problem: NO BEES. I haven't seen a single honeybee all spring. There have been some big bumblebees and smaller waspy-type bees, but NO honeybees. This is not good. Already it is very obvious that our regular apple trees produced fewer blossoms than last year. We didn't see any bees around those blossoms this year either. Yes, we've been reading about the diminished number of bees for a couple of years, but I really can't get over the absolute absence of honeybees when the weather has been so encouraging for maximum blossom production. 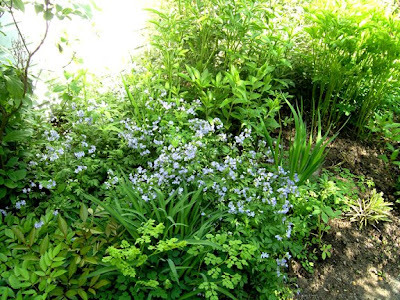 No bees equals no fruit and vegetables unless farmers can hand pollinate all the blossoms. I think my pessimism is warranted and not just a symptom of my addled brain. 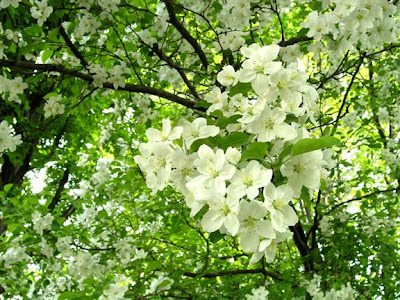 And to live without this perfume in spring would mean bereavement on top of calamity. "Wax Actual, the group show of representational, encaustic painters in the Creative Alliance's upstairs Amalie Rothschild Gallery, has trouble finding a voice for the medium it seeks to champion. 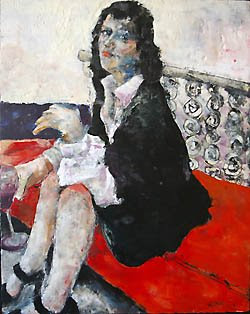 The encaustic medium--basically pigmented hot wax, which is generally turned to for its seductive ability to capture light or produce flat or uniquely textured surfaces, as in the paintings of Canadian artist Tony Scherman--loses its excitement between the conservative imagery and erratic application. Curated by Creative Alliance's resident encaustic painter, Christine Sajecki--whose work far outstrips any artists she includes--and writer Joseph Young, the exhibition looks self-defeating, presenting the medium, in most cases, as extraneous." 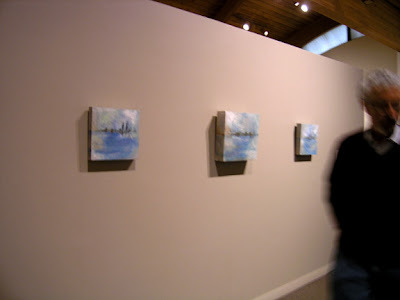 This very strange review does not fault the creators of the 10 paintings in the show for their ability to make good paintings, but chastizes them for making encaustic look like watercolor, oil or acrylic. Isn't that weird? If it were a show of oil paintings, I'm sure he wouldn't use the same basis for criticism - that the paintings failed to use oil paint in a way that he thought they should. 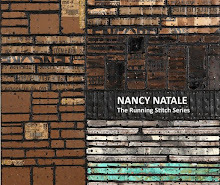 The reviewer complains "Without the title tip-off, it would be hard to guess that encaustic is a common thread throughout the show." Isn't that a good thing? 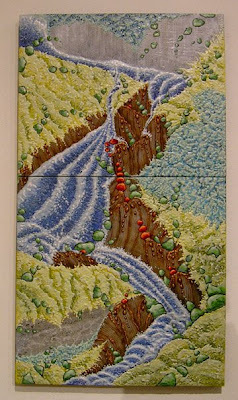 The artists were concentrating on making paintings and were not so intimidated or overwhelmed by considerations of the medium of encaustic that they just made paintings. Why is that bad? Or another complaint: "Jeff Schaller's "London" shows a woman in an unnatural, hunched posture with the word "London" painted horizontally across the canvas. While the overall image is slick, the paint is applied thinly with no attention given to the medium's ability to be built up and modeled." Apparently this critic thinks that every encaustic artist has to employ the same method of painting. But one of the beauties of the medium is that it can be used in so many ways. 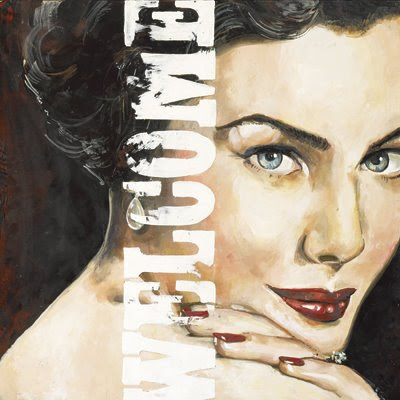 Jeff Schaller "Welcome Back", encaustic, 36"x36"
Or how about this which I think is mostly approving: "Sandra Sedmak Engel, Pat Dennis, and Rebecca Cason, all Baltimore-based painters, demonstrate a contrastingly sophisticated craftsmanship, if slightly more passé imagery. Engel's stylized portrait of a young woman, entitled "Going to Brighton Beach," is composed and crafted like pieces of a puzzle. Relatively smooth and pleasingly waxy on the surface, closer inspection reveals what looks like a careful, reduction process of grooving the hardened background before adding additional color to the surface. 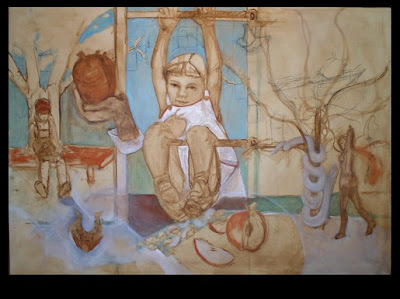 Her meticulous manipulation of the wax prevents the colors from mixing, and produces crisp, controlled line work." 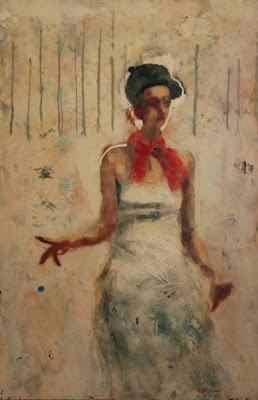 Sandra Sedmak Engel's painting, "Going to Brighton Beach"
Image by Pat Dennis - not sure if it's oil or encaustic - uh oh! 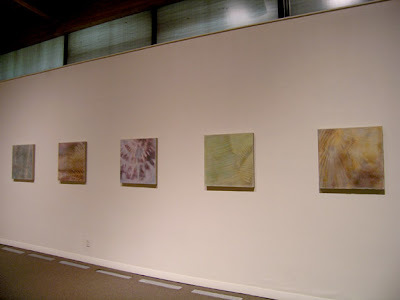 The review concludes: "The exhibition overall is an insignificant sample of the encaustic medium. Aesthetically inconsistent and undoubtedly limited by its given space, the show fails to present a compelling case for the narrow subject matter on which it focuses. In presenting a show of encaustic work, a fairly unpopular medium, broadening the subject matter and choosing the best examples of encaustic painting would have better served the general curatorial mission." 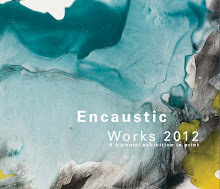 I'm not even going to comment on the description of encaustic as a "fairly unpopular medium." This reviewer just didn't get it because the curators spelled out their mission, which was to assemble "work from contemporary artists who seek verisimilitude in their paintings through the inherent qualities of wax. We looked for work that uses the properties of wax—both its ability to hold shape and light and its pliability—to their best effect." This seems reasonable. 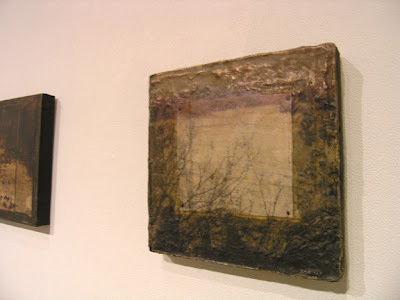 They had a very limited space and so restricted their selections to representational work in encaustic. So all this got me thinking, isn't the medium strictly the choice of the artist? 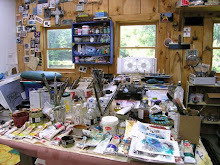 It's the means that an artist chooses to make the work that the artist wants to make. Outside of that, who cares? Unless you collect works in a particular medium, what's the difference? It's the work that counts, not what it's made from. Encaustic will do pretty much whatever you want it to do and smell good at the same time. Can't beat that!